These championships were plagued by poor weather which at one time, created unrowable conditions and at other times, unfair conditions. The weather was unseasonal and varied every day - normally the weather is stable and calm at that time of year. It was influenced by a cyclone which came down the WA coast in much the same way as occurred in 1989 when the Nationals were cancelled. The five years of drought in Victoria did not help matters with the course surrounds dusty and dry. The drought certainly did not disturb the Victorian team who took out the points score trophy for the most successful team. Organising Committee: Brian Vear (Chairman), Regina Kennedy (Event Co-ordinator), Grant Cogriff, Eric Waller, David Deeble and Andrew Guerin. 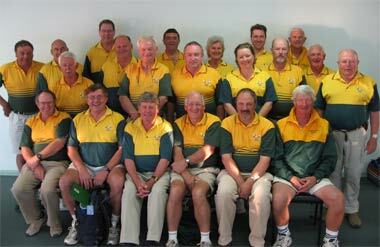 Jury: Steve Hinchy (QLD - President of the Jury), Michael Eastaughffe (SA - Competition Manager), Bob Pennington (SA), Peter Huggett (QLD), John Murdoch (WA), Craig James (WA), Phil Fraser (TAS), Nick Hunter (ACT), Rene Klupacs (VIC), Barnaby Cundell (SA), Rod Dobell (TAS), Brian Nash (WA), Reg McKay (VIC), Rod Florence (VIC), Victor Walter (NSW), Ron Beattie (NSW), Bob Cook (ACT), Kelly Jenkins (VIC), Kerry Bligh (TAS), Brett Woolfitt (WA) and Lyn Bayliss (WA). Event Staff: Alice Evans & Chris Grummett (Regatta Secretaries and Timing), Sue Lovell (Office Co-ordinator), Kris Szatsnajder & Denis Bourke (medical), Phil Sandford (Office support), Wendy Jenkins (photo finish), Roger Wilson & Ray Ebert (commentators), Lynne Charge (Volunteer supervisor), Hugh Hindle, Jennifer Schouten, Laura O'Bryan, Tamara McPherson, Robin Burrows, Bill Webster, David Grubits, John Nichols, Geoff Hardy, Peter Darbyshire, Bob Morrell, Annie Harvey, Pauline Day. The Victorians led from start to finish, marginally increasing their lead at every 500 m mark. In fact, all crews kept their position throughout the race after the 500 m mark. The race was a Victorian versus New South Wales affair with New South Wales never giving up. In these conditions, it was appropriate that these two crews were in adjoining lanes. The time, whilst not fast, was exceptional in these conditions. Crawshay had the favoured lane eight and James McRae lined up next to him on lane seven. Crawshay took an early lead and extended it over the second 500m. McRae then started to work through the lead established by Crawshay but only managed to hold him during the last 1000m. The experience of Crawshay showed through the youthful McRae and we look forward to more races between these two scullers. Peter Hardcastle kept with the pace especially in the latter stages of the race. The Western Australian crew were favourites but drew an unfovoured lane three. Despite this, they lead throughout the race. The Tasmanians fought well from lane seven but could only gain on the early WA lead in the last 500m. 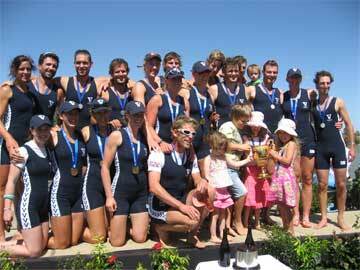 The New South Wales crew won well despite a challenge from the strong Queensland crew on the adjoining lane. The NSW crew started well with a 3.67 lead at the 500 m mark. The Queensland crew drew closer in the middle 1000m. The NSW crew used the last 500m to assert their lead. 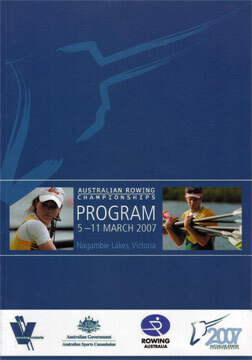 The race was therefore won in both the first and last 500m where NSW got a lead and then capitalised on it. It was a great race between these two crews. The Victorians showed their strength by winning from the unfavoured lane two. The New South Wales crew used their lane advantage in the first 500m but the Victorians hauled them back in during the second 500m. It was clear that this was to be the Victorian's race with no crew going to disturb their ambitions. Pippa Savage drew the favoured lane eight and had to row through the field to win despite a great effort from Kerry Hore from lane three. Savage was fourth at 500m and had the fastest second 500m to move closer to Hore. It was in the third 500m that Savage took the lead and the race gaining over 3 seconds off Hore. The margin extended over the last 500m. It was a classic race with both Savage and Hore racing superbly. Hore taking the race to Savage and holding on. Savage worked through the field when they were vunerable to take the race. This was an interesting race with the favourites South Australi proving their favourite status from lane three. However their challenge came from a less favoured lane two, Victoria and to a lesser extent Tasmania on lane five. However the result was never in doubt with SA leading through every 500m except the last. Perhaps there are to be some challenges to SA from the Victorian and Tasmanian sculllers. This was an interesting race with the Victorian crew leading throughout the race from the unfavoured lane two. The Victorian crew took the race from the other crews in the first and second 500m. They then held on as the New South Wales crew pegged them back from lane five. In the end the NSW crew failed to catch the Victorians despite a far faster last 1000m.